This year’s catering conference event was held in Las Vegas, NV from March 8th-11th attracting thousands of attendees, vendors and celebrity chefs passionate about their craft. As a recent Grad student with the University of Florida’s Mass Communication Marketing program, I participated in an assignment requiring me to monitor and review the overall performance of the annual event. The following interpretation is a marketing student’s perspective of the event’s overall IMC performance. 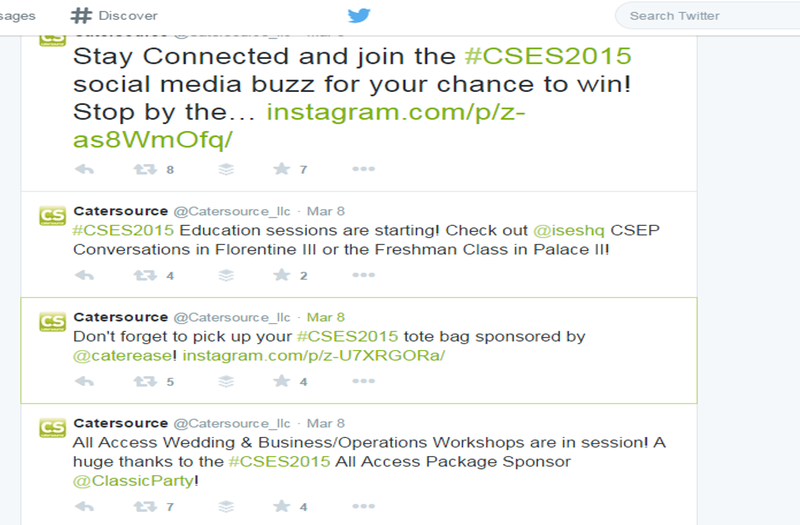 Great communication overall on twitter, but a bit lacking on their other social channels. 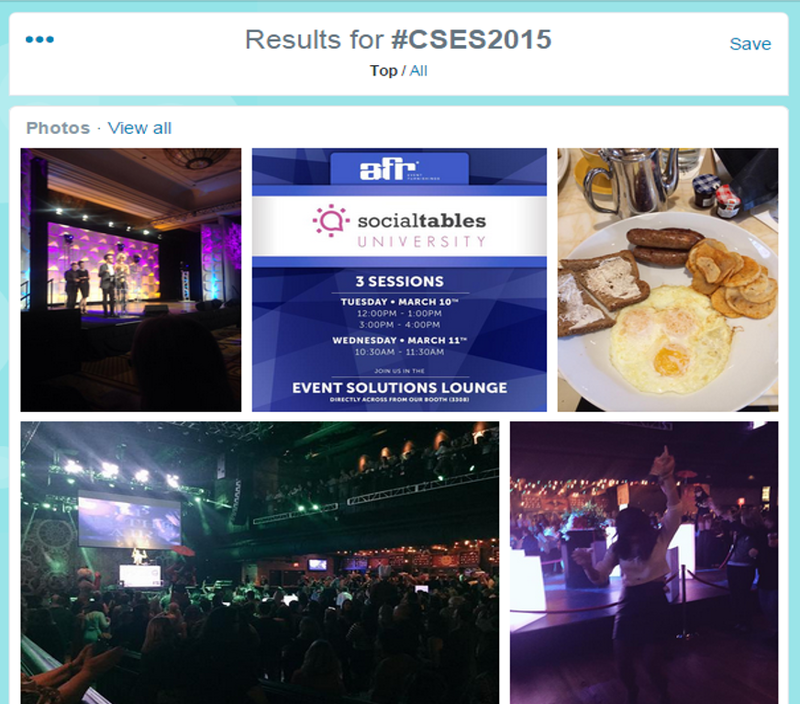 I was notably impressed that they were able to keep the online chatter happening all year round under the event hash-tag #CSE2015. The real engaging promos began four months earlier with the announcement of celebrity chef Marcus Samuelsson. What was Missing? I discovered there were over 70 speakers in total scheduled at the event that were not mentioned socially. Starting in November, there was ample time to tell each of the chef’s stories on Facebook and an overview of what each planned to discuss would have greatly increased interactions and connections. There was a very engaging consistency of “in the moment” events (shared on Twitter) that alerted visitors via step-by-step updates of what was happening over the 4 days. Posts included highlighting vendors, event activities and fun events and “tweet ups” that happened as networking contained on and off the event grounds. What was Missing? 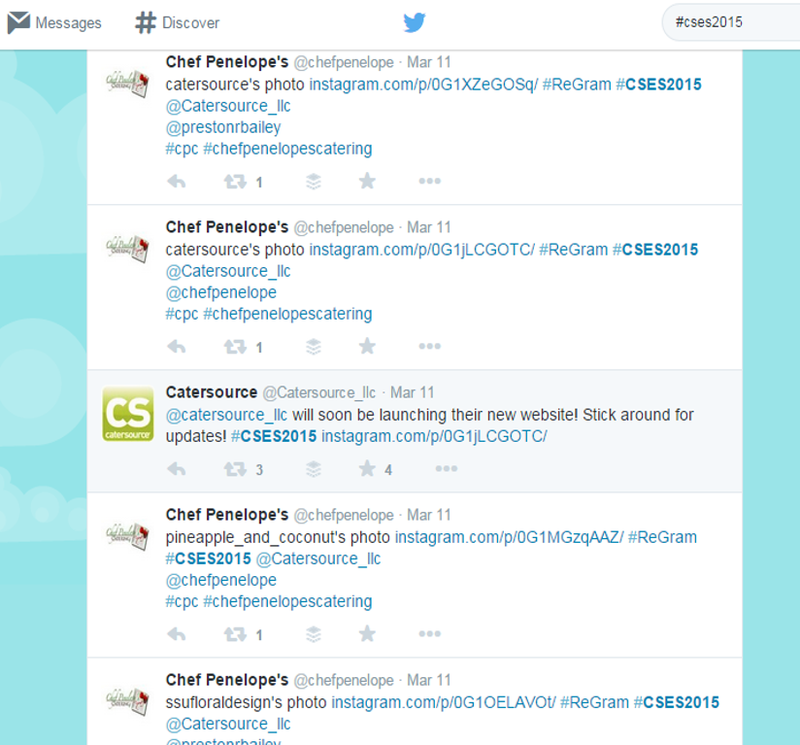 Images were scarcely shared by catersource during the event both on Twitter and Facebook. Although the posts included rapid fire info on what to do and where to go during the event, the lack of visual media fell stagnate in the cascade of posts taking place. More images and video updates would probably resulted in more interaction. I found No posts made after the event. As of March 14th there hasn’t been a post since the 11th across all channels. And no mention of the show in their March 12th Newsletter. Ouch! This is a good time to mention that marketing campaigns should not start and stop. Rather they should flow fluidly and grow upon one another to further engage your community. What was Missing? An overall recap was only present on Twitter. It’s still early so I’m wondering if a recap will show up in their next newsletter. 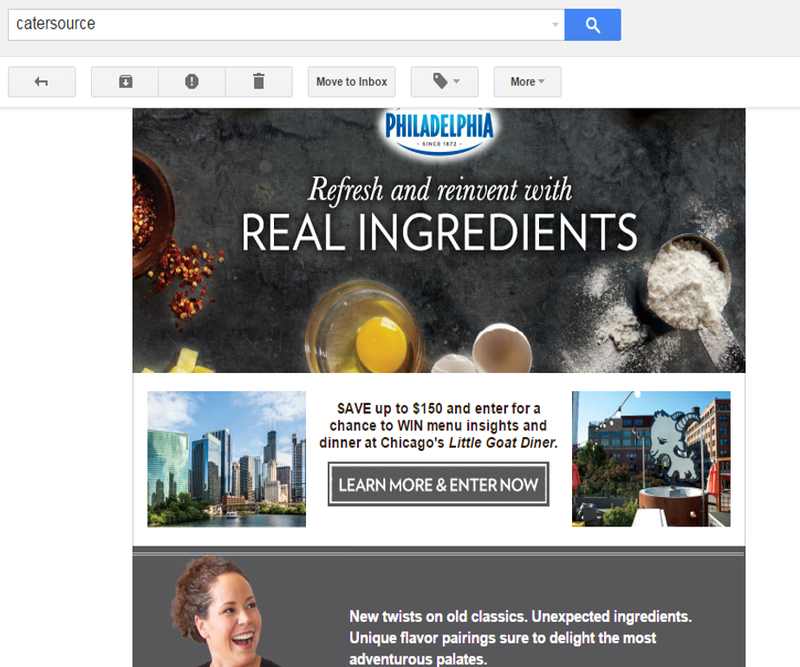 Hoping they continue the momentum by telling compelling content marketing stories build around user generated content. Not to mention all the content that could of been collected during this event to create social posts for the year leading up to the next years event. Although they are active on all major social channels the best response by far is their Twitter responses found under the hashtat #CSE2015. Hundreds of tweets were sent out in the form of tips, alerts, promos, speakers, and of course exquisite cooking examples. Facebook. Populated 7 posts during the event that took place between the 8th-10th. There were no posts on the last day of the event and as of the 14th no post event content has been posted to their page. The majority of the posts were live event actions shots of folks at the event. There were two promo posts alerting guests of a very broad promos. There was one post for a local Vegas event. Instagram. included behind the scenes photos of neat finds as cater source made their way through the event vendors. Twitter. Had the most engaging mix of content and included everything from schedule recommendations, demonstration, educational opportunities and evening meet up opportunities. The opening tweet was a promo that…. …was then followed with a play by play of what to expect during kick off. That continued with session, demo and discovery alerts throughout the day. What was Missing? Keep content relevant to the platform in use. I noticed their tweets lacked digital media such as video, or photo clips. The photos they did post came from Instagram shares that had a link back to Instagram. 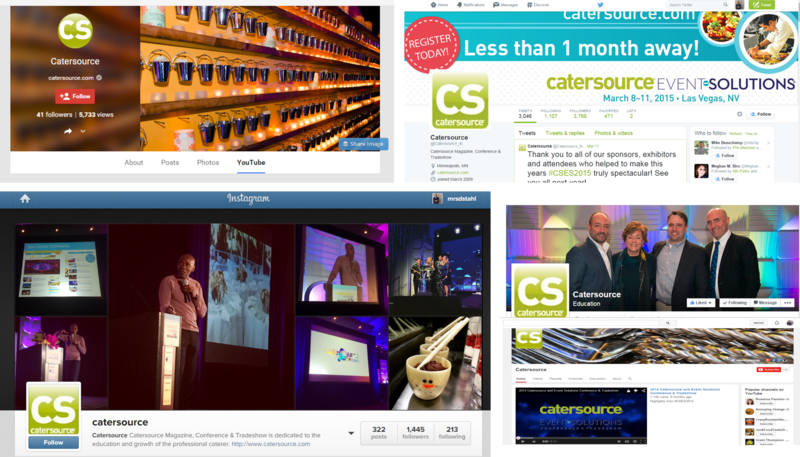 Cater Source did a superb job keeping on top of a variety of day’s events. I was just disappointed that they were all text only updates a small portion of the posts had media images. People are motivated by watching others interacting and enjoying life. Fantastic job showcasing vendors at the show but I didn’t see any posts highlighting or even explaining how their sponsors fit into the overall event. With over 50 sponsors there was a missed opportunity for one of a kind content marketing. The only thing I was unable to determine was whether the awards given during the event were named after sponsors or even funded by sponsors. If so, that would have been a great time to showcase the sponsors in post format. The ultimate mix of IMC should be ever present across both traditional and digital marketing plans. Since I only monitored the digital marketing functions I was only able to compare email, social and website marketing formats. In the 2 emails I received after signing up for their newsletter, neither email mentioned the event. There was a newsletter sent the day after the event ended and still had no mention. Great newsletter overall. Compelling content, great visuals and neat tips. But there was a missed opportunity to showcase the wrap up, thank sponsors, tell attendees stories and continue the connection process and community building format. Although the use of their logo is ever present, that really was the only digital consistency I found across 5 of their major used platforms. Inconsistent branding leaves visitors confused and promotes a loss of confidence in what a company is capable to achieve. When branding is inconsistent it creates the appearance of inferiority. In the world of content marketing businesses are desperately seeking high quality content. For that reason I’m excited about the amount of user generated content they were able to gather. Depending on how they use this, there is a chance to double next years participation. What was Missing? I feel they missed the opportunity to create a seamless event function across all web platforms. For example for 5,000+ likes on Facebook their engagement percentages were rather low. Knowing how to communicate on each platform may have resulted in more responsive content. On Facebook, users expect to be entertained and learn something new. Also, I’m curious if they set up steps to determine the event’s ROI? Was there a goal set to to reach a certain # of likes/follows prior, during and after the event? If not, this would be the most harmful missed opportunity.